I’ve previously explained that a large part of what I do for my clients is negotiate reductions in their medical bills, that way when they get their settlement, they keep more of it and have less bills to pay. Often, those medical providers will have filed liens to enforce their medical bills. And medical providers are not the only ones who may have filed liens to attach to your settlement proceeds. In this post, I’m going to further discuss this topic of how liens affect your settlement, and what I do for my clients to attempt to reduce the impact of those liens. Liens are security interests used to satisfy a debt. Google defines lien as a right to keep possession of property belonging to another person until a debt owed by that person is discharged. In construction, a mechanic’s lien attaches to property the mechanic repaired or worked on, as a means of forcing the customer to pay the mechanic. 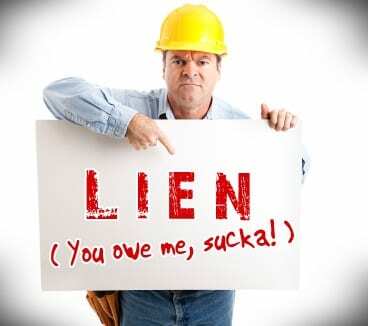 If the customer does not pay, the mechanic can foreclose on the property to satisfy his lien. In personal injury lawsuits, there are certain types of liens that attach to the proceeds of any settlement or verdict. Such liens usually involve the payment of funds or billing of services related to the injury that is the subject of the lawsuit. Here are a few examples. In Oklahoma, certain types of liens attach to your injury settlement proceeds, and must be paid in full unless your attorney negotiates a reduction. Liens relating to your injury case are very serious matters that must be addressed, because they attach directly to your settlement proceeds. That means that once you get the money, the holders of such liens can garnish that money from your bank account or get a court order to obtain the money from you. Therefore, we always address liens early in our cases. We want you to keep as much of your settlement as possible. Below are the major types of liens that we commonly deal with in our practice. Those who provide medical services are entitled to a lien on any proceeds from a lawsuit that is related to injury that required the medical services. As I’ve explained before, I will ask the court to reduce these liens as a matter of equity (fairness) when they greatly exceed the amount of settlement or insurance coverage. I always do my best to ensure that the client walks away with money in his pocket. Subrogration is when another insurance company has already paid for your medical bills, and they are seeking reimbursement from the money you will receive in your lawsuit. So for example, you were injured while shopping at a business, and you go to the hospital. You use your own health insurance to pay the bills. Later, you hire a lawyer to sue the business for causing your injuries. If you settle the case or win a verdict, your health insurance company may seek to get reimbursed since it paid for your hospital bills. This doesn’t mean they will get the entire amount of your new settlement. I have been successful in negotiating a reduced amount with insurance companies, which means the client keeps more of his/her settlement. My goal is always to give the client the best of both worlds: client walks away with medical bills paid and money in his/her pocket. Anytime the government pays for some of your medical bills (and they only pay pennies on the dollar of what is billed), they are entitled to reimbursement from any future verdict or settlement. In fact, it’s a violation of federal law to try and avoid paying them back. And both plaintiff and defense are on the hook for criminal liability. The Feds treat this as serious stuff, and therefore so do I. We always make sure we get a conditional payment letter from CMS (Centers for Medicare/Medicaid Services) and get them paid! Even though your child support obligation may have nothing to do with your personal injury lawsuit, Oklahoma law gives the State of Oklahoma a lien for past-due child support that attaches to any proceeds of an insurance settlement. Recently, the State has been less willing to negotiate a reduction of these types of liens, and they will use the courts to go after your settlement proceeds. A story with a happy ending: How I negotiated with the State of Oklahoma to allow my client to keep all of his settlement and instead continue his existing payment plan toward his back child support. Even though the State has a new policy of non-negotiation with regards to child support liens, I recently made a deal with them to forgo attachment of their lien to my client’s settlement proceeds. I recently obtained a large settlement for a client involved in a high-speed car accident on the highway. While the settlement might seem large, the man had very serious injuries from the wreck. Further, he was already unable to work, as he was disabled from a lifetime of manual labor that destroyed his lower back. He had a large child support lien, and had been making monthly payments toward it out of his Social Security check. The State wanted to take half his settlement and apply it toward the back child support (all of his children were grown up, and they would not have gotten the money; it would have just gone to the State. Also, he raised the children, but never asked the court to modify his child support obligation, so the support to the absent mother continued to accrue). I was able to convince one of the lawyers at DHS to keep taking monthly payments out of his Social Security check, and let the client keep the money. In this particular case, they agreed! And my client got to keep all of his settlement. This was an unusually pleasant outcome, because legally, the client was screwed and risked losing most of his settlement. Sometimes honest sweet talk actually works, and I try my best whenever I can! If you have more questions about how insurance, medical, or government liens affect your settlement proceeds, feel free to send us a message and we’ll try to answer your question as soon as possible.